With our Full-Color Canopy Printing program we digitally print designs and images on entire canopies at a low minimum, price, and turnaround. This Double Canopy Inverted option is modeled after our Inversa Inverted Umbrella (SB-4600). 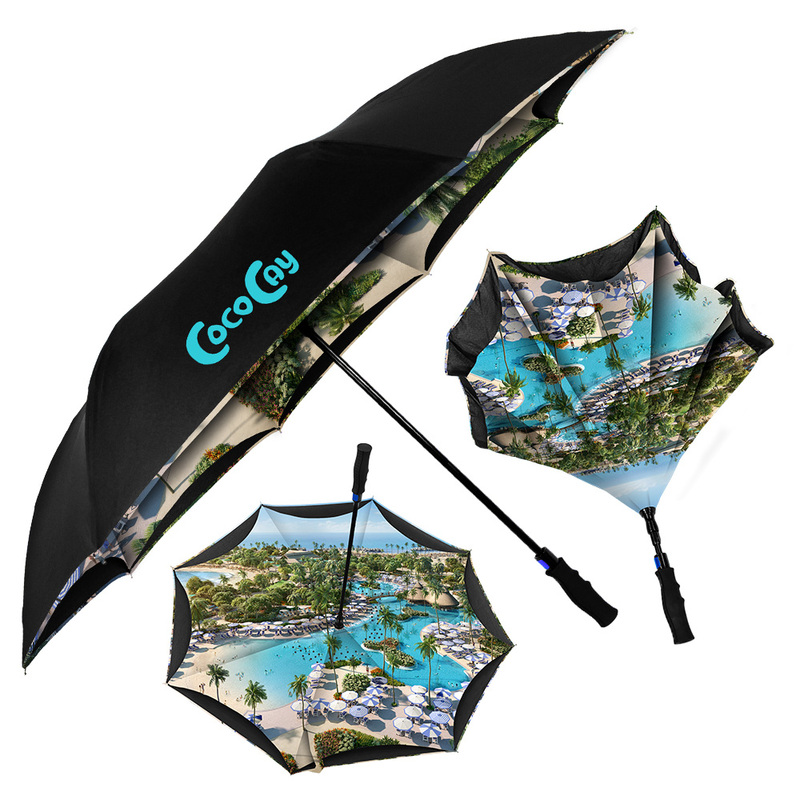 It has two layers of fabric allowing for one full-color bottom or top canopy printing; plus a 1-color, 1-location imprint on the solid fabric canopy. THE COLORS AND IMPRINTING YOU NEED WITH A 1-PIECE MINIMUM! When in-stock canopy color choices just don’t meet your needs, you can create your own custom color combinations – with just a 1-PIECE Minimum! The StrombergBrand exclusive Color-Your-Way Bistro Patio Umbrella is unmatched in its number of possible color variations, value and fast turnaround. Its commercial quality with patented construction ensures you’ll make a lasting impression. Perfect for outdoor cafés, hotels, swim clubs, pizza parlors, ice cream shops, delis, country clubs, and more! 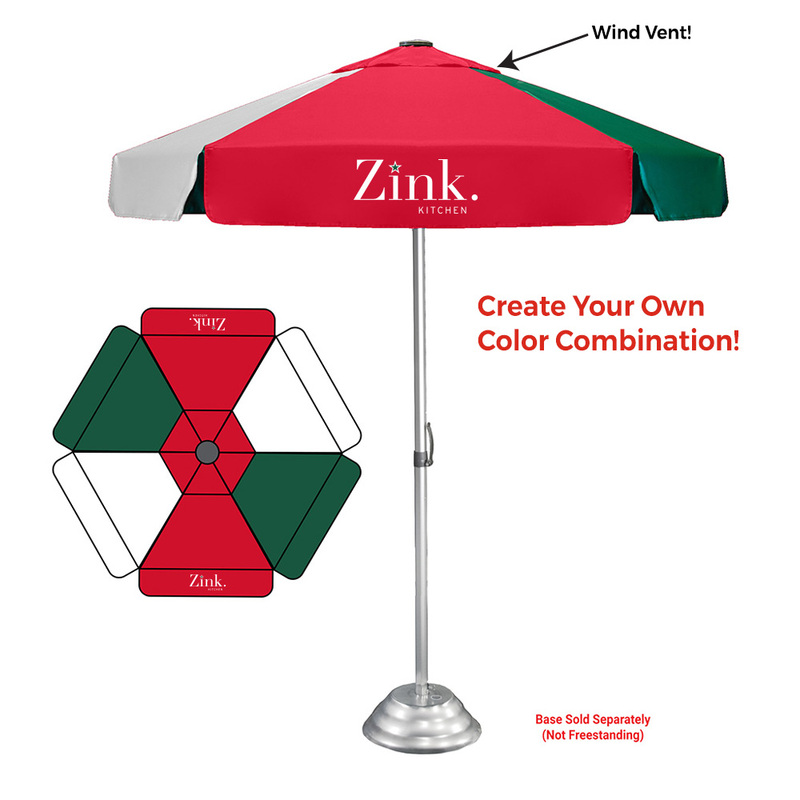 Bases are are available in two styles: high-density plastic and aluminum (patio umbrellas are not freestanding). A third style (a freestanding base) is coming soon! Create your own custom patio color combination, using any of the 10 stock canopy colors shown below! When in-stock canopy color choices just don’t meet your needs, you can create your own custom color combinations – with just a 1-PIECE Minimum! The StrombergBrand exclusive Color-Your-Way Market Café Patio Umbrella is unmatched in its number of possible color variations, value and fast turnaround. Its commercial quality with patented construction ensures you’ll make a lasting impression. 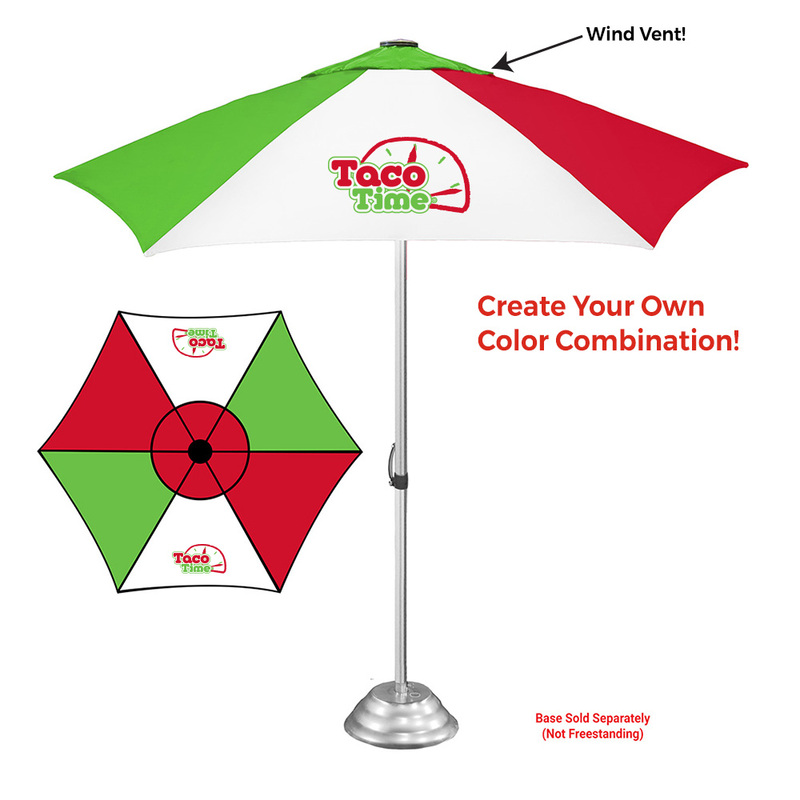 Perfect for outdoor cafés, hotels, swim clubs, pizza parlors, ice cream shops, delis, country clubs, and more! Anchor any of our patio umbrellas with our exclusive base that allows umbrellas to stand without additional support. 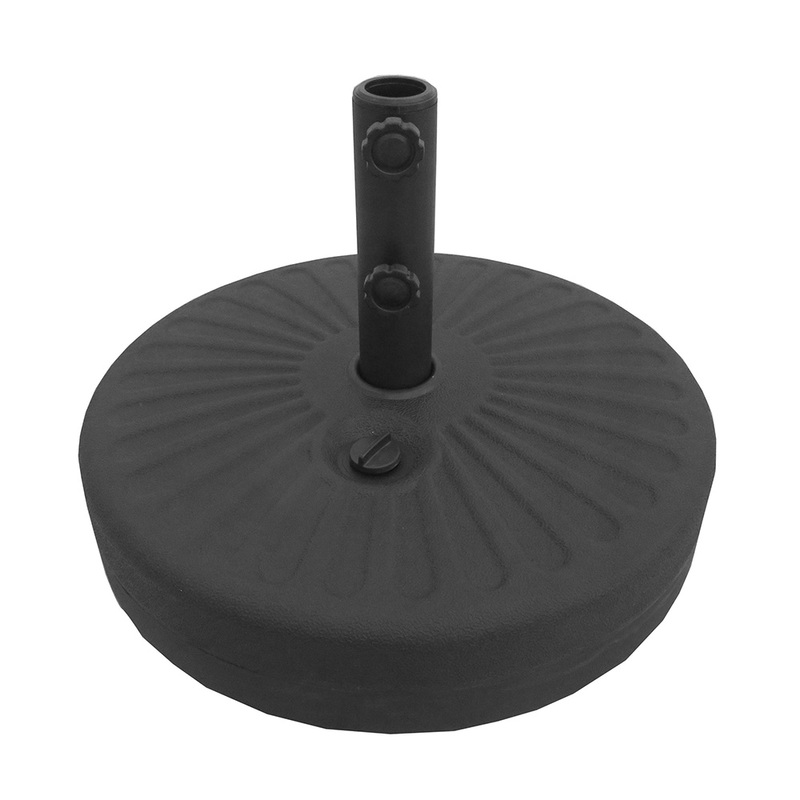 This attractive black base easily fills with water, adding all the support a patio umbrella needs. No table required! Wide bottom provides greater stability than typical bases. Long pole receptacle can accommodate umbrella poles that have 1” (25mm), 1.5” (38mm), or 2” (50mm) diameters. The base weighs approximately 6 lbs when empty - much lighter than similar units on the market, making it easier and less expensive to ship. When filled with water, however, it weighs up to 47 lbs, to secure patio umbrellas against light winds! One or more units: $70.00(C) each.